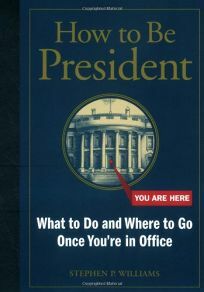 Dubya may already know the ropes, but John Kerry might find this handbook useful should he find himself residing at 1600 Pennsylvania Avenue next year. If the general state of affairs hasn't improved from today, he may want to skip right to chapter four:""Getting Serious--Dealing with Crises and the Press."" Among its handy tips is this piece of cynical advice: embarrassing news should be released on Friday afternoon because people pay less attention to the Saturday news. Elsewhere, Williams answers the FAQ how does the president get snacks? But even readers who have no plans to become POTUS will find unusual info here, such as detailed maps of the West Wing and Air Force One, and an explanation of what the""nuclear football"" is. Sometimes funny, sometimes informative, this volume will amuse anyone obsessed with presidential trivia.